“It was as surprising as a thunderbolt out of a clear sky. Had it been a position on the moon it could not have seemed more improbable—would I accept a position as matron at Ellis Island, qualified for Boarding Duty, answer immediately, etc. “I knew nothing about the Immigration service. 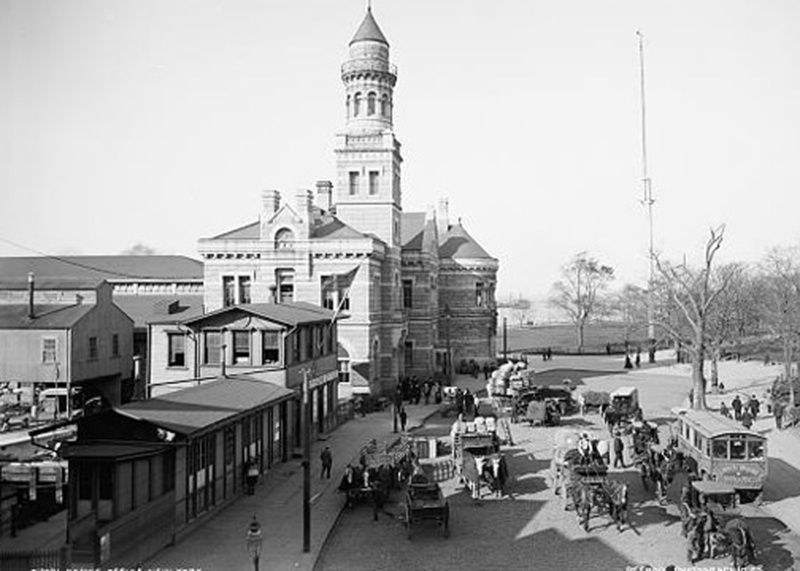 To be sure, I had heard that Ellis Island was the place where the immigrants were examined the same as old Castle Garden—but Boarding Duty, what could it mean? “The conductor on the train told me that the terminal of the railroad was in Jersey City and that I would have to take a ferry boat to New York, ‘just follow the crowd’ from the depot. I did so and went into what seemed to be a fairly pleasant waiting room. ‘The crowd sat down, so did I. They waited, so did I. By and bye, they all rose and went toward a door and I supposed the ferry boat had arrived, so I went to the door also when someone near me said, ‘Well, we are in New York at last, and so we were. Instead of it being a waiting room, as I thought it was, it was the ferry and we had been crossing the North River while I thought we were waiting for the boat. . . .
“It was after midnight when we reached a hotel. In the morning I asked the maid in the hall how to get to the Barge Office where I had been directed by the Commissioner in order to get to the boat to the Island. “For a wonder I arrived at the Barge Office without losing my way, went onboard the Ellis Island boat, passed ever so many watchmen who asked me ever so many questions and finally found my way to the Commissioner’s office. . . .
“Next the Matron in Charge took me round the Island explaining things. . . . She said that they were not very busy that day as there were only about three thousand immigrants to be examined. To me it looked as though all the poor people of Europe had come in on that day. “Out in Kansas no one was very wealthy but no one was so very poor. . . . In all my life I had never seen people so desperately poor except some of the reservation Indians and we always thought they were so poor because they were an uncivilized people—but these were people from the civilized countries, so of course, they must be civilized. That is what Americans think. . . yet many of these immigrants. . . are no more civilized than our North American Indians, the reservation Indians, I mean, the real ‘old timers,’ as we used to call them in the Indian Service. “As I stood and watched the immigrants coming in, it looked as though they would never cease, every minute was an hour, and the line, two by two, kept moving on. The Doctors were examining their eyes and scalps at one place . . . on the line. Two Matrons, very grave and dignified, stood there looking and occasionally taking some woman or woman and man out of the ranks. Officers stood at different places giving strange commands in foreign tongues. Little children were crying, tugging at the mother’s skirts, the tears making streaks down their tired dirty faces, some of the many babies were screaming. Men and women and children were also bending under burdens which seemed almost beyond their strength to carry—bags, bundles, great packs, valises without handles tied together with rope, little tin trunks, great baskets, cooking utensils. . . .
“So many looked weak and starved, so many were filthy and dirty . . . so low and degraded looking, and so poor, so dreadfully poor! And I—I had to stay. . . .
“[Next day] when I reported for duty, the Matron in Charge introduced me to a Matron and told her, ‘Show her the ropes.’ . . . As I soon learned that the way of doing anything seemed to be of much more importance than . . . doing the duty itself. “Every day, the terrible feeling of being in a place from which there was no escape grew upon me. 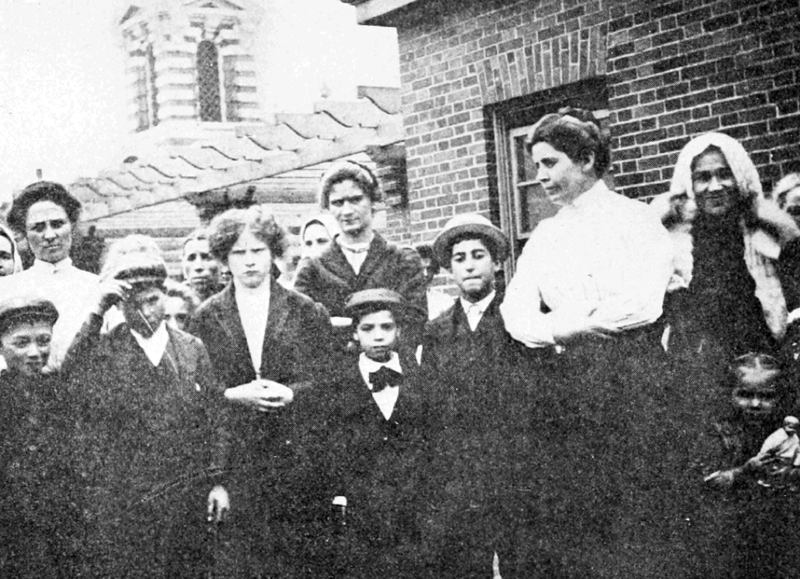 The noise and confusion, the curt commands of the officers, the Sundays the same as other days—for the Sabbath is not observed at Ellis Island—the thousands of poor people arriving every day, the misery of the deported.